Small and highly portable, USB powered data acquisition system and vibration meter ideal for vibration and rotating machinery analysis. SMALLEST DAQ: SIRIUS mini is our smallest, 4-channel data acquisition system, mainly suitable for acoustic, vibration, and angle measurements. UNMATCHED PRICE: SIRIUS mini ships off-the-shelf with high-quality signal conditioning and world-leading, award-winning data acquisition software for the best price on the market. USB POWERED: SIRIUS mini does not require any external power supply. It can be powered straight from USB connection, for example, a laptop. 4 IEPE/VOLTAGE INPUTS: System is configured with 4 high dynamic analog inputs, dual sigma-delta ADC's with 200 kHz per channel sampling rate and up to 160 dB dynamic range. COUNTER/ENCODER/DIGITAL INPUTS: System is configured with one counter/encoder input and is capable of 3x digital inputs, 1x event counter, encoder, period, pulse-width, duty-cycle. Precise frequency and angle measurement use patented SUPERCOUNTER® technology. SIRIUS mini is very compact, mobile data acquisition system perfect for acoustic, vibration, and rotating machinery analysis. With its four voltage/IEPE inputs it can acquire data from four accelerometers, microphones, or voltage sensors. Additional counter/encoder/digital input adds ability to connect any counter/encoder sensor and measure RPM, angle, and frequency on rotating parts. This combined with vibration data you can perfectly use SIRIUS mini as a vibration analyzer for preventive mantainance or any other testing task. SIRIUS mini is so small it will fit in your laptop bag or even in your pocket. There are no big and clumsy power supply cables needed. Just SIRIUS mini, your laptop, and a simple USB cable and you are ready to measure. USB cable will provide data and power for the DAQ device. DualCoreADC® technology - amplifiers with DualCoreADC® technology include dual 24-bit ADC's with 200 kS/s/ch sampling rate and achieve astonishing 160 dB dynamic range in time and frequency domain. This is ideal for dynamic measurement and analysis. SuperCounter® technology - this technology provides precise and synchronized to analog angle and frequency measurement from digital counters. This serves as the basis for order tracking analysis, torsional vibration and similar applications. 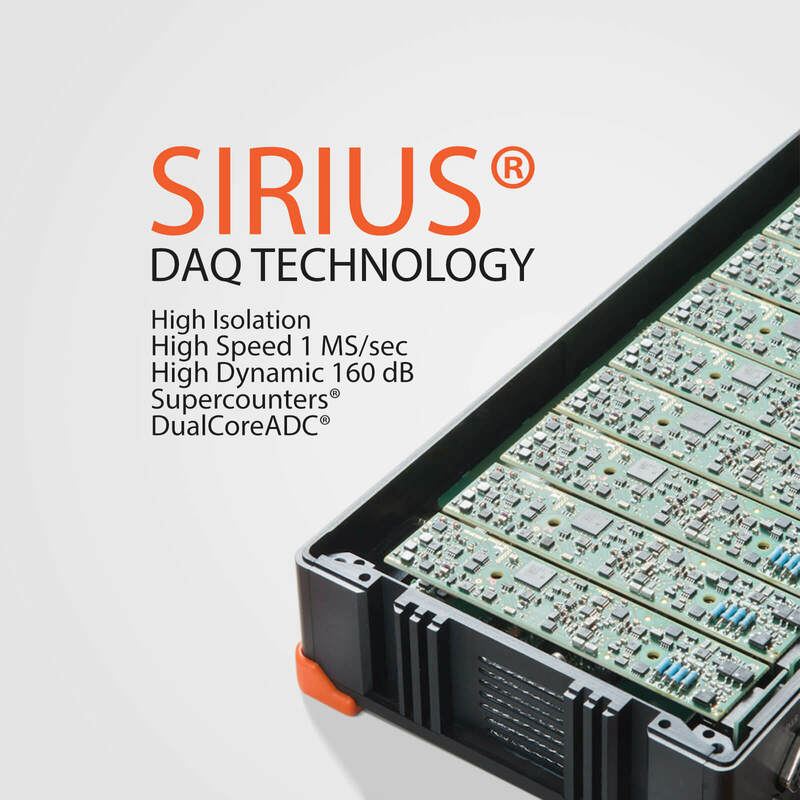 Visit SIRIUS data acquisition system page for more information. Please note that all amplifiers on SIRIUS mini are differential.